Les Misérables has been on stage for twenty-nine years. It is the longest running musical on the West End and has won more awards than can be listed here. More people have seen the musical worldwide than the entire population of the UK. A lot more. Les Misérables tickets are still selling out and the cast continues to play to a packed house. The enduring brilliance of this now legendary musical cannot be denied. Adapted from the novel by Victor Hugo, Les Misérables is an epic tale of love lost and found, sacrifice, redemption and the human spirit. The action is set in nineteenth-century revolutionary France where ex-convict Jean Valjean has been hunted for decades by the merciless policeman Javert after he breaks his parole. However, when Valjean takes on the care of Cosette, the young daughter of factory worker Fantine, everything changes. With music composed by Claude-Michel Schönberg and libretto by Alain Boubil, this is a sung-through musical of extraordinary imaginative power and musical prowess. Now at London’s Queens Theatre, the sets and costumes add to the incredible sense of drama and scale. The frenetic revolutionary setting is truly brought to life and the stirring music, with songs including ‘I Dreamed a Dream’ and ‘Do You Hear the People Sing’, is given a fitting space in which to thrill and move the audience. Wasn't to sure about going not having seen any interpretation at all. My wife was keen having seen other interpretations and I'm so glad she persuaded me. Thoroughly enjoyed it from the very first scene through to the heart rending finale. Cast were amazing , so talented , was gripped the whole way through.. The show was amazing, stunning and breathtaking. This was my third time going and I honestly can't wait to go again. This is one of the most outstanding productions ever!! Bought our tickets as a surprise for my granddaughters birthday, to say she was happy was an understatement! It had everything, amazing singing, acting, one minute you were crying then the next you were laughing. Well worth seeing. I went to go see the afternoon performance and I was overwhelmed! It was absolutely amazing!!! I would definitely recommend. Singing was perfect was an amazing day! Twenty years on and still has the most amazing impact. Singing, acting and scenes quite mesmerising. Absolutely amazing show. When it finished I could have sat through the whole thing all over again. Everything about it was excellent. The actors, their voices, the sound system, the revolving stage, the scenery, the cannons and the guns, the orchestra and the child actors were fab. I could not recommend this show highly enough. Best Show I've ever seen. Fantastic singing throughout. Was a little disappointed that you took a commission of nearly 20% on the face value of the ticket! Saying that it was still well worth the Money! I have seen this show twice before and couldn't wait to go again. The performance was fantastic, but the overall experience wasn't quite as good as the previous two times. I think this was mainly to do with the seats. Great performance, music, set and direction. Definitely better than the film and I loved the film. This was our second time viewing Les Miserables, we sat at the front of the royal circle. From the very start the acting and singing was outstanding, Jean ValJean and Javert were particularly mesmerising in their performances. We have been to the theatre many times before but this performance was by far the most engaging and emotive of them all. Fantastic show, amazing performers, must see show! Matinee performance on 6/4/19. My 4th time of seeing this fantastic show (once in every decade since its opening). It never disappoints and god willing - I shall be seeing it again. My companions first viewing of the live show in London although she had seen the film and really liked that. I wanted to treat her and take her to the live show as there is nothing like seeing it on the London stage. Her comment to me was - "It's an experience I shall never ever forget - simply brilliant". She was as fascinated as I was as to how even just the scenery was achieved. Yet another standing ovation and so well deserved. The whole experience simply takes your breath away..... Good luck with the refurbishment of Queens Theatre - we do agree - more loos are required. R S Neave. absolutely out of this world! from the sets and scenery to every actor/actress. amazing amazing amazing! Play was amazing as were actors , it was faultless . Theatre was freezing , everyone sat with their coats on !! Wrap up warm and you’ll enjoy it . Me and my wife have really enjoyed the excellent vocals with intense music along with the emotive story line. We would definitely recommend this show. What a fantastic performance - I have never seen anything quite like it on stage. The set and performances were first class and I can't imagine ever witnessing a better production. A massive well done to all the cast and crew - you had me laughing, crying and loving every minute!!! It will live in my memory for a long time to come. Thank You! Great singing.Fantastic set. A dramatic and emotional experience. Theatre staff are friendly and helpful. I brought my sister and friend this time. Fantastic Value and and Javert this time. It was absolutely amazing! Strong powerful voices and fantastic sets! The best show I've ever seen at theatre. Totally awesome! 1st time dragged by my mom but it was wicked good really enjoyed it. This has got to be one of the best performances we’ve seen of Les Mis, it was absolutely fantastic and well done to the whole cast. Spectacular! Was so impressed I could have watched it all over again! Fabulous show as always, shed more than a few tears and thoroughly enjoyed the show! I have seen Les Misérables a number of times, but I think this particular cast has to be one of my favourites. Everything about it was superb, and the singing fantastic. This was the sixth time I have seen this amazing show. Every time it just gets better. This production was superb. All the cast are to be congratulated, plus all those behind scenes. Here's to the next visit! Quite honestly, one of the best shows I have had the privilege to see! It will make you laugh, make you cry, it is absolutely phenomenal! Les Miserables is the best Musical we have ever Seen !That is ehr we have seen it the fourth time now. The Organisation in the Queens Theater Nerds improvement.The Break is clearly too Short. Or the bar Serving the Drinks is too Slow-probably they should Not Serbe Cocktails in the Short Time. There are Not Toilette dir all Fürsts.So it was impossible to usw. the min the Break besäuselt of the Long Queues. I have seen this show many times yet each production varies depending on the cast list. Although the Queens is a much reduced stage production than The Palace, it worked well. Lead parts of Valjean and Javert played by Dean Chisnall and Bradley Jaden were outstanding. 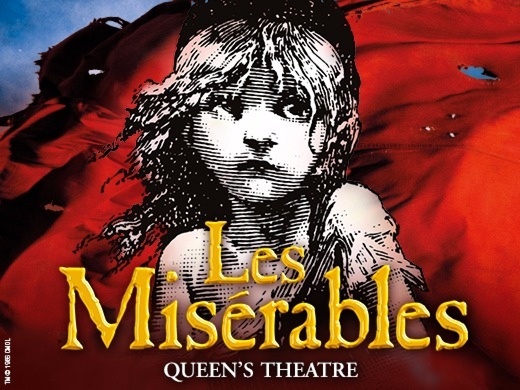 Strong performance from Carley Stenson as Fantine and Toby Miles as Marious and the smouldering looks of Samuel Edwards as Enjolras made up the outstanding members of the cast. That said all excellent but this was a production I really enjoyed. Hands down the best show I have ever seen! Patrons please note: the performance includes gunfire, smoke and flashing light effects.